Our new RIT/FAST/RIC Identity Bands are made of 6.8oz Nomex with 3M 2" reflective letters and Triple Trim. They attach using a Nomex elastic strap with snaps for easy on and off. The Identity Bands are made to withstand heat and abuse! 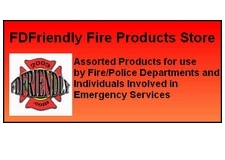 Also available: SAFETY OFFICER, MANPOWER, OPS, HAZMAT, MEDICAL, STAGING, EMT or choose your own!